Imagine traveling across the desert. The journey is long, your camel ride is bumpy, and you’re not even following a map! Instead, you follow a star. How would you feel? Would you have the faith to keep going? Two thousand years ago, the Wise Men did exactly that. They saw a brilliant star in the east and journeyed to Bethlehem to honor the Christ child with beautiful gifts. And the Wise Men weren’t the only ones watching the star. Across the ocean, on the American continent, the Nephites saw the star and knew that Jesus Christ, the Son of God, was born. Today, thinking of that star reminds us of the Savior. It shone in the darkness and showed the Wise Men the way, just as Jesus showed us how to live. The star was also constant, just like the Savior’s love for us. The next time you look at the stars, remember that Jesus Christ is the Son of God and the Light of the World! Jesus Christ compared Himself to many things. By studying these comparisons, we learn more about Him. 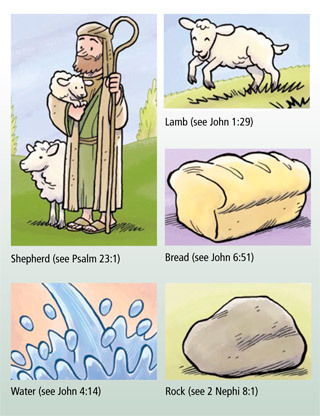 Read these scriptures as a family and discuss what these symbols tell us about the Savior. 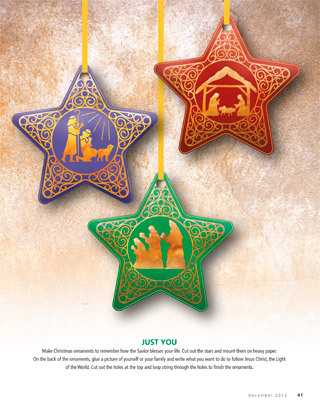 Make Christmas ornaments to remember how the Savior blesses your life. Cut out the stars and mount them on heavy paper. On the back of the ornaments, glue a picture of yourself or your family and write what you want to do to follow Jesus Christ, the Light of the World. Cut out the holes at the top and loop string through the holes to finish the ornaments.